Stronghold flea and worm medication is another fine example of a multifaceted and all inclusive medication to defend your pet against all sorts of foreign invaders. The advantage of a treatment like Stronghold is that it is a sort of one stop shop for almost any parasitic problems you might encounter. 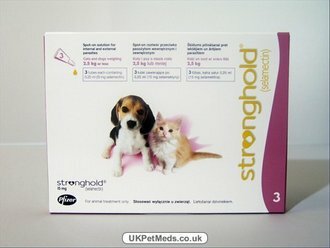 True to its name, Stronghold turns your pet into an indomitable fortress designed to take out parasites at every turn. This simple spot on medication protects your pet on the outside from fleas, sarcoptic mange, ticks, and ear mites as well as the inside from worms that plague the intestinal tract and heart. The active ingredient in Stronghold is known as Selamectin. It’s a water resistant chemical that absorbs into your dog or cat by way of the hair follicles and skin, it then travels through the sebaceous glands, bloodstream, and intestines going to work on whatever foreign attacker is closest at hand and all set to be destroyed. It has separate uses depending on which animal it’s used on. In dogs it kills certain varieties of fleas as well as the aforementioned ear mites, while in cats the chemical takes its pound of flesh from intestinal worms. To be more precise, it works most notably against hookworms and roundworms. Like any other spot on medication that’s worth its salt, Stronghold is convenient in a number of ways. For starters, it’s fast acting. It begins killing parasites within 30 minutes of an application. It’s long-lasting as well. Just one treatment is worth 30 days of parasite protection. Another great feature is that bathing the dog won’t reduce the drug’s efficacy, at least not after a grace period of 30 minutes, right about the time you’d want to start washing off the dead fleas! Another lesser known bonus application of Stronghold is its effectiveness on newborn puppies. Puppies are too young and fragile to be treated with any pet medications directly. However, it’s perfectly safe to treat their mother before the litter has been weaned. Do you get where this is going? 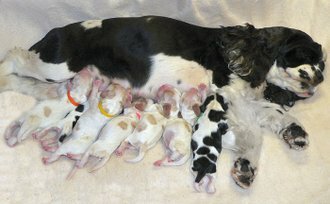 The lactating mother canine is able to act as a filter and transmitter for the puppies’ flea prevention. It’s a handy feature, because it’s absolutely heartbreaking to see a defenseless puppy fall prey to the negative effects of a filthy parasite. If this product is starting to sound a little eerily familiar, it may be because of a passing familiarity you have with another nearly identical name brand of pet medication: Revolution. In fact, it might surprise you to learn that Stronghold and Revolution are one and the same. They are identical products sold under different names in different parts of the world. Why the discrepancy? Only the fine folks at Pfizer (the manufacturer of both) would know. Regardless of their reasoning the only difference in the two products is the packaging, and no matter your choice in aesthetics, both products are available at Petbucket.com. Order your supply in advance and save on shipping today!